Groundnut in bloom this last August on our riverbank. Beans will follow. This is post two of hopefully three about groundnut. 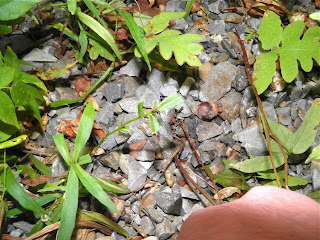 I recently did an exploratory dig to find out what I would be dealing with when I gathered enough to make a recipe. As always, only harvest from an unpolluted spot. small ferns and riverbank plants. The digging was easy and the result impressive. I only stuck the shovel in once and up came a tuber about the size of an egg. This from a vine that was only about 4 feet long! 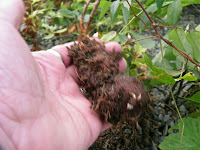 Most of the vines where I will be foraging are substantially longer, and should have larger tubers at the end. Older tubers can reach grapefruit size but may not be as "choice.". 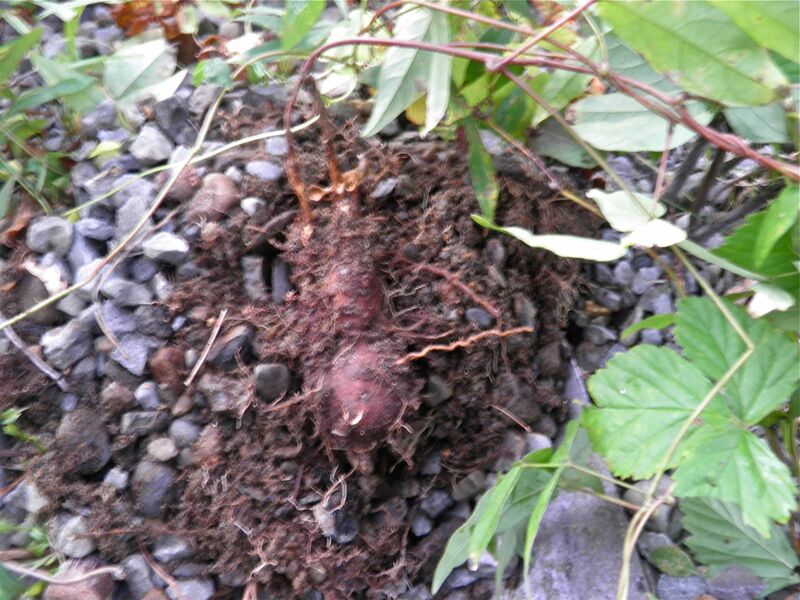 Groundnut (Apios americana), also known as hopniss or in Mi’Kmaq language sequbbun, is a perennial vine native to all of eastern North America. It bears edible beans and large edible tubers. It grows to 9-12 feet long, with leaves arranged in opposite pairs 3-4 inches long along the leaf stem. The flowers are red-brown to purple, resembling sweet peas, but in a much denser cluster. 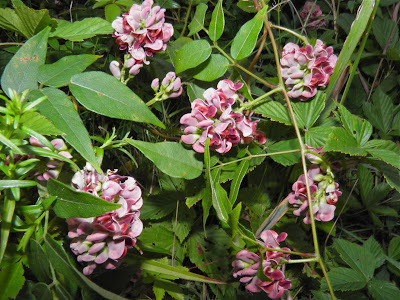 The flowers form edible beans. Freshly dug, the bottom ball the size of an egg. Groundnut is nutritionally sort of a cross between beans and potatoes. 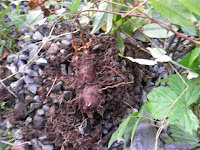 The tubers contain 11%-14% protein, which is far higher than potatoes or any other common root vegetable. They also match the protein content of wheat. The amino acid profile is like beans. Groundnut complements most grains to form a complete protein for the diet. Groundnuts can be eaten raw or prepared several different ways. The taste is somewhat like a cross between a peanut and a potato. I’ll let you be the judge. One thing is for certain, they’re unique. They come from the ground, so first you have to wash them. Also try to remove all the little roots that are on the surface. 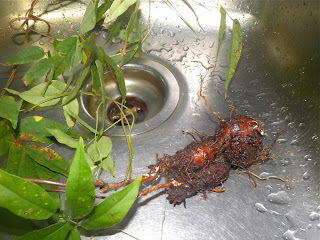 Like a potato, you peel them, and removing the roots makes the job easier. 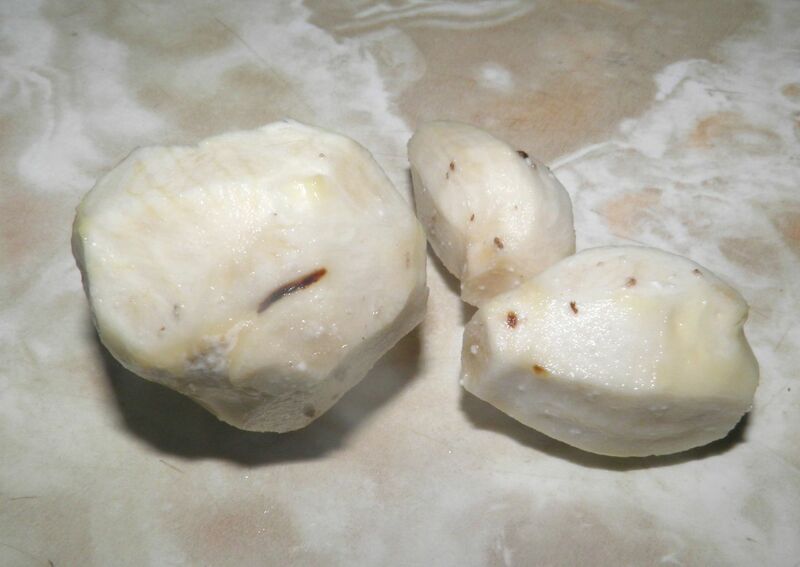 Discard any soft tubers and cut away any blemishes or dark spots from the remaining firm ones. perhaps with a vegetable brush. Ground nuts can be boiled in salted water like any other vegetable. They can also be roasted like root vegetables and served as a side dish. You can make a meal by roasting them in an oven on low heat until completely dry. Afterward they can be stored for a substantial time. Once dried, they can be ground and the “flour” used in pancakes or other baked goods. Just remember they have no gluten so will not aid in rising bread. It is best to cook groundnuts before eating because they contain trypsin inhibitors and cooking makes it more digestible. Trypsin inhibitors are chemicals that reduce the availability of trypsin, an enzyme essential to nutrition in many animals, including humans. Undercooked groundnut, like beans, can also cause significant gas. Some people like the taste of raw groundnut. Most do not, which may be a good thing. I’m on the fence. I don’t know about the gas. I only ate a little to try it. The fruits of just one stem, and about 10 seconds work. I’m still looking for something interesting to cook with these things. I've read they're at their best roasted and mashed with butter, salt and pepper, but that seems a bit boring... I’m sure I’ll dream up something soon!